Would you like to learn how to do wildlife pencil drawings? Pencil drawings have been used to capture wildlife for many years, and are used by naturalists and artists to make a record their observations. 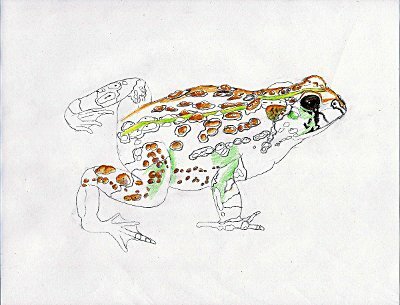 You don't need to be a talented artist to use pencil sketches and drawings to help you learn more about the natural world. By using a pencil you can learn to take notice and record key details such as unique field marks of an animal. Like a photograph, this can help you really look closely at the details. Even more than taking or viewing photographs, the process of drawing forces you to notice even the subtle differences in color, texture, pattern and light. It is best to start learning wildlife pencil drawings, and nature study in general, by making observations of what you see. It can be tremendously helpful to find a local park, wildlife refuge or green space to go and observe wildlife. Though even your own backyard will have wild animals that can be observed and then drawn. All you need is some paper and a simple pencil. Mechanical pencils are great because they provide a fine tip for more detailed drawings. A notepad or clipboard will allow you to carry your paper with you anywhere you might need it. You might also wish to invest in a set of colored pencils that you can use to do the final detail work. What are field marks and why should I notice them? Field marks are those features of an animal that can be used to distinguish it from other animals. Every animal has distinct features such as particular colors of fur, markings on feathers, length of legs, shape of bill, size of ears/feet/head/tail or overall body. Wildlife pencil drawings make taking note of these features quick and relatively simple. When you can make a record of these features, not only does it make identification of the animal easier later on, but you have also created a mental association with it that is likely to stick with you. The act of observing and then drawing engages more of your sense and larger areas of your brain than just plain observation. This means you are more likely to remember what you saw, and remember in greater detail rather than if you only used your eyes alone. This is a technique to help you pay attention to and record details you notice. Sometimes seeing and trying to draw the entire animal can be overwhelming. So for starters, you could try to take it in smaller pieces. It can be really helpful to focus in on smaller areas of the animal's body when doing wildlife pencil drawings. 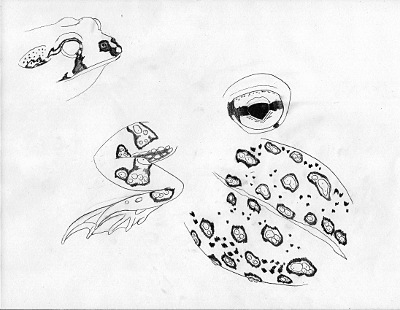 For instance draw the face, tail, feet, wings or other features that stand out to you. Take note of what stands out to you. Asking yourself questions can help. For instance: What do I notice about this animal's parts? Does it have a unique bill? Does it have intensely color eyes? Does it have scales or fur of a particular texture or pattern? Every animal has its own unique way of moving around and carrying itself. They can often be recognized by the way hold their bodies. This might be the way a turtle sits on a log in a pond, the way a mouse crouches as it nibbles on seed or the way a snake curls its body. Draw the animal's entire body now. Work on getting the appropriate body parts where they belong and keeping them proportionate. Once you have the entire body drawn out, you can now focus on adding details. Notice the patterns and colors on the body. You have the option to use colored pencils here to create a more life-like representation of the animal. If you prefer, you could also take it beyond pencil drawings and use other media such as markers, water colors, acrylic or oil paints. Though using pencils alone can be very satisfying, even just sticking to only the gray colors of graphite can be wonderful. In this case the final drawing was colored and finalized using only pencils. The drawings on this page were done by starting with a basic mechanical pencil for the sketches, then completed with colored pencils to bring it more to life. 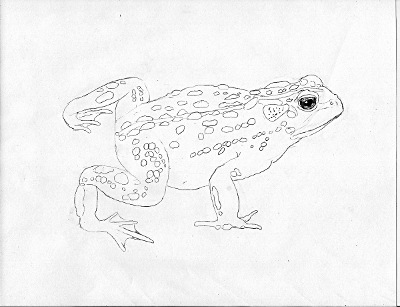 The subject here was a Boreal toad (Bufo boreas) and some of the key field marks can be observed such as: pale line down the back, thick body and short legs, oval shaped parotoid glands behind the eyes, and warty skin. 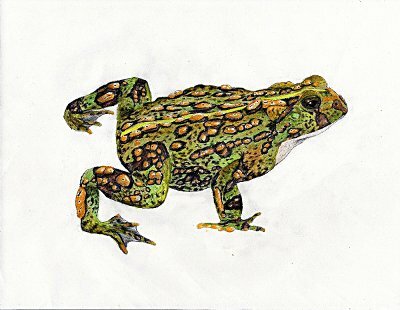 This article is meant only to be a basic introduction to wildlife pencil drawings and there is much more than can be studied on the subject. It is a learned skill and you will improve with practice. For more information and other techniques in drawing, please check out How to Draw Birds. Check out wildlife pencil drawings on Pinterest.